Obituary for Russell D. Warner | Scala and Roefaro Funeral Home, Inc.
Mr. Russell Duane Warner, age 92, of Utica, passed away on Wednesday January 30, 2019 at the VA Hospital in Syracuse, NY where he was a life-patient resident. He was born in Mohawk, NY, on December 2, 1926, the son of the late William W. and Nellie Rice Warner. Russell first attended Mohawk Central School and later West Canada Valley Schools. He was first employed at Daniel Green Footwear and the Borden Co., both of Newport, NY. Subsequently he was employed at Rome Air Depot from 1943-1973, later renamed Griffiss Air Force Base. He worked in various positions at the base and retired as an aircraft re-fueler. 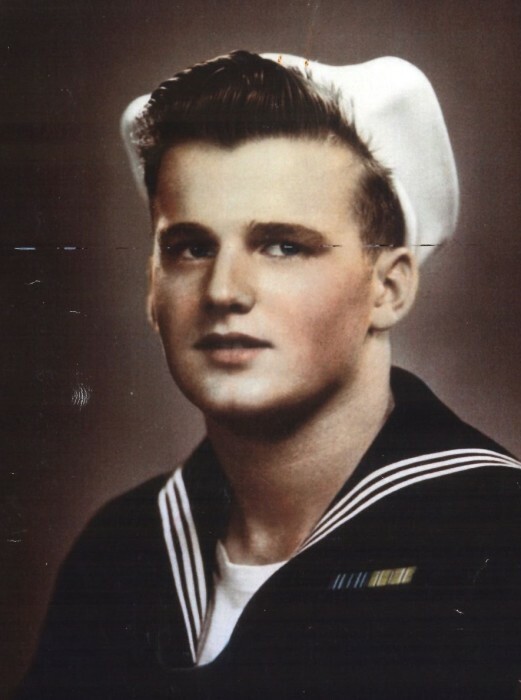 Russell served in the U.S. Navy during WWII from 1944-1945, aboard an amphibious LCT in the South Pacific, namely Uthili Harbor. He was a life member of VFW #368, the DAV, the Sampson Navy Veterans of WWII, and the Senior Citizens of North Utica. He married Ann E. Deighton of Middletown, VA, a WAF at the base, at the Methodist Church, Verona, N.Y. in 1953 by Rev. Walter Suits. This union of 49 years produced “twin girls” in 1962, Ann Elizabeth and Elizabeth Ann Warner. His wife passed away in 2002 very unexpectedly, after a very long and blessed marriage. Ann was a fine wife and outstanding mother. Besides his beloved wife he was predeceased by his parents, two half-brothers, Vincent and Lawrence Briggs; his son-in-law Thomas Fox and his granddaughter Tina Ricca. Surviving are his twin daughters, Ann E. Ricca of Utica, and Elizabeth A. Fox of Utica; grandchildren, Bette Fox, Mary Fox, Ann Marie Rondon and husband John and Jason Ricca; nephew William Briggs, as well as several great grandchildren and dear friend David Julian. Visitation will be held on Monday morning from 11:00 am until 12:00 noon at The Scala & Roefaro Funeral Home Inc. 1122 Culver Ave. Funeral prayers will be at the conclusion of visitation at 12:00 noon in the funeral home with Michael Servello, Pastor of the Redeemer Church officiating. Military Honors will be conferred. Private interment will be in Forest Hill Cemetery. In lieu of flowers, donations may be made to the Clinton Pet Vet Animal Rescue in memory of Russell.